Try RailRoute demo 0.5 – Automation Update! Demo R0.4 Released – From the Beginnings! 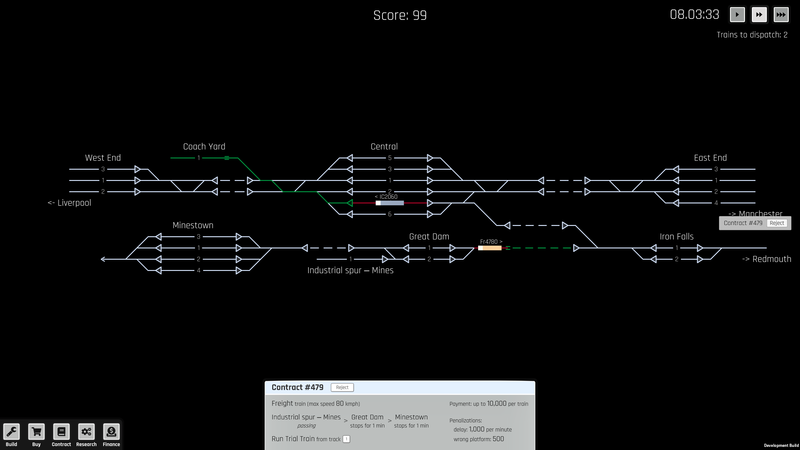 Rail Route is a rail network management and operations simulation game. You negotiate contracts, build railroads, set up routes for trains and control the traffic. Unlock features to your dispatcher interface, upgrade railway network elements and research new technologies that allow you to automate the operations! Currently, we are in a prototyping phase and we will post updates about the progress of the game development. We would like to hear early feedback from the community so we will release playable prototypes regularly. Subscribe if you would like to receive news about the game and be notified about new blog posts. We won't spam you!